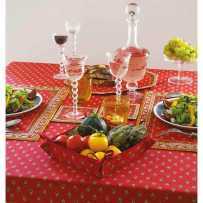 Gorgeous Jacquard tea towels at low price! We no longer present the village of Moustiers in the Alpes de Haute Provence, famous for its blue and gold bird faience decor. 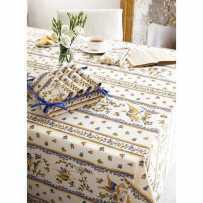 The print of this very Provence tablecloth is a faithful reproduction of the pattern found on ceramics. In the center is a country bouquet in the shape of a very light rosette without more embellishment. 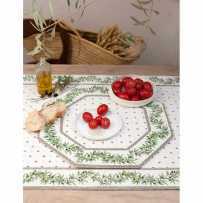 On the width of the table template, mini bunches with leaves are dotted in a very airy way. The drop is decorated with Moustiers birds drawn in movement, in different positions. The bird is accompanied by a delicate little butterfly traditionally painted on faience in his company. The decoration is surrounded by two small gold friezes matching the wings of the birds. To complement your table decoration, Moustiers napkins framed with the bird motif placed in a corner, are recommended and available here. A lovely basket is proposed for bread. 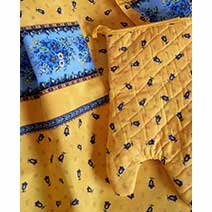 Other coordinates will please you: table mats, gloves and pot holders for the kitchen. We particularly recommend the octagonal sets of very beautiful confection, and squared. In blue or pink, you will love them! 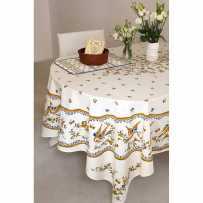 If you want to personalize your reception, this round tablecloth is the best among wedding tablecloths. 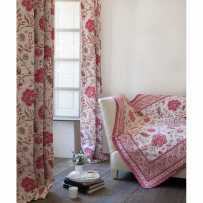 Not only does it combine quality with ease of maintenance, but it will also bring a touch of Provence and poetry. This is an original and fine theme, with light colors warmed by some touches of gold. 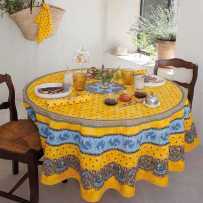 The pattern lets the table top breathe. Your guests will be conquered for sure! 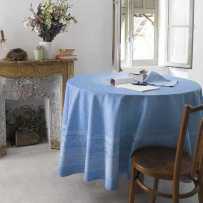 All our household linen is made with care in the South East of France with quality textile materials. In order to preserve all the qualities of your article, we recommend you to follow our maintenance advices. 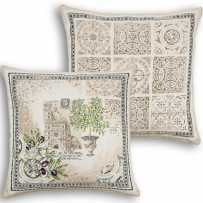 This will help you enjoy the features and properties of your house linen longer. 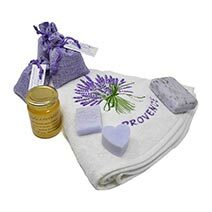 Some tips : to wash your laundry, we recommend Marseille soap, a natural and really effective product that the washerwomen (lavandieres) of Provence used formerly. In addition to being environmentally friendly and harmless to the skin and the environment, it cleans and removes stains perfectly without damaging fabric. 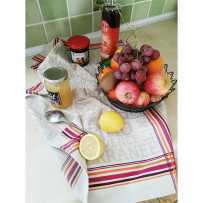 You can also use white vinegar as a softener: it's natural too. 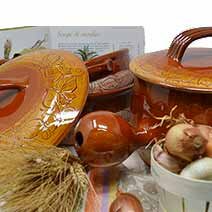 Do not hesitate and follow the example of Provencal housewives, back to fundamentals: it's good for you, for your home, and for the planet! For TEFLON treated or coated fabrics: we recommend to iron on the reverse side of the fabric to reactivate the properties of anti-stain treatment.